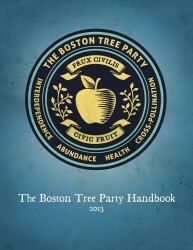 So we present to you the Boston Tree Party Handbook, which contains a wealth of information about planting and caring for heirloom apple trees; ideas and suggestions for community activities, discussions, and events; and lots of educational articles. This is an essential tool for all our Tree Planting Delegations, but it’s also a very useful resource for anyone planting heirloom apples trees at home, or groups working with fruit trees in a community setting. Please enjoy this wonderful resource, and feel free to share widely.